While driving from Accra to Tamale our vehicle overheated. Sitting in a stationary vehicle in the tropics in the middle of the afternoon has little to recommend it to the sane. So we got out and found shade. 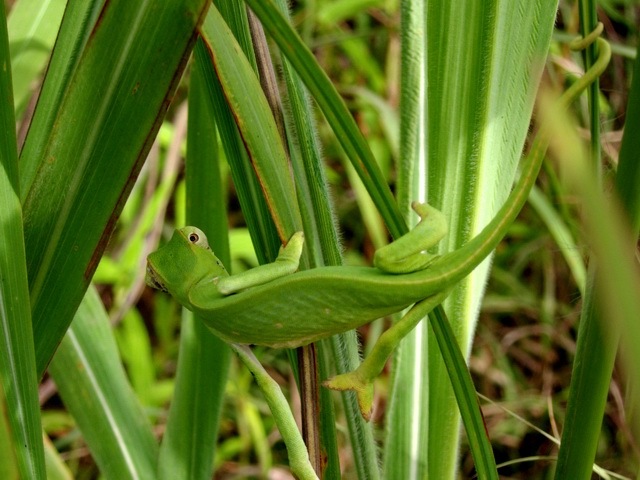 One of my fellow passengers spotted a juvenile chameleon in a clump of elephant grass. Out came my camera. While the slow and patient adult chameleon will pose almost endlessly for any photographer, this young fellow did not want the publicity. He was racing (well, in chameleon terms) around the grass to escape. He obviously was not aware of the dangers of speeding away from determined paparazzi. But then, he did not have a chauffeur and so was doing his own driving. Meanwhile, I was single-mindedly bending and bobbing to stick my camera into the elephant grass at the angle and moment that would get me a photo for which the tabloids would pay big bucks. I finally caught him in the bizarre pose seen in the second photo. To keep track of me, he has twisted one of his independently revolving eyes so far around that it is glaring at me backward over the top of his head. Seeing that, I experience a curious combination – a gasp of awe and a chuckle at the same time. Did God intend that parts of his creation strike us as awesome and amusing at the same time? Here we have a creature who can keep one eye peeled on where he is going while tracking paparazzi behind him with the other. The heat, fatigue of travel and my crazed photo hunt must have fried my brain because the most bizarre thought came into it. 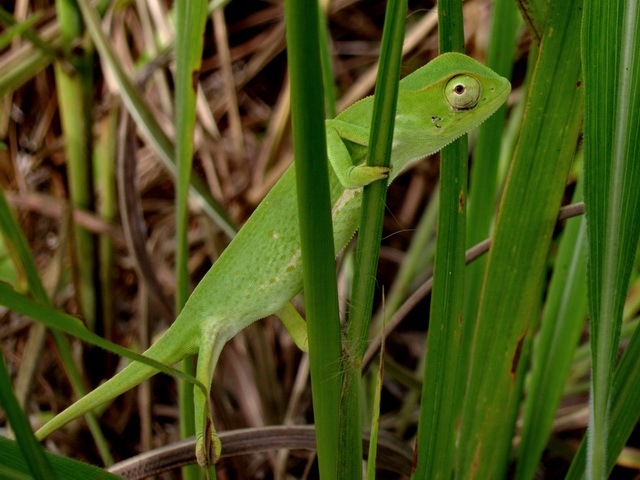 If he weren’t green and reptilian, this little fellow might make a good spokesman for car insurance. This entry was posted in Animals, Humor and tagged camelion, paperazzi. Bookmark the permalink. Hey Ed…I like the way you wrote your story. The pictures are great, especially the eye shot. I feel like I’m getting to know you better. Please stay in touch…I have a vision to support missionaries with short documentary video capturing passion, vision and history…all to support missionaries, at no cost! Its been on my heart for more then 5 years…still waiting on the Lord, but gaining experience. The Lord works in mysterious ways I guess.